In order to qualify to rent a vehicle from Coast Truck Rental, renters must be at least 21 years old with a valid driver’s license. We also require an authorization on a credit card for a minimum of $350. We do require it be a credit card and not a debit, check or ATM card for the authorization at the time of rental. We collect what is actually due when the vehicle is returned, and at that time, any method of payment is accepted. Employers wanting their employees to pick up vehicles need to arrange credit card authorizations ahead of time and should contact the office directly. Liability insurance is required by the state of California and is not included in the rental rates. 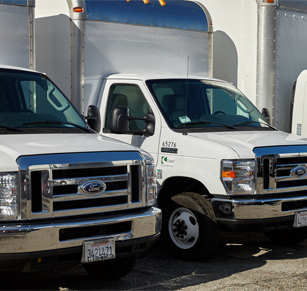 Your own liability coverage may follow you to a truck rental, although some policies may be restricted by the size and weight of the vehicle you are renting. For this reason we always suggest that you check with your insurance provider before renting. We sell two different levels of third party liability insurance, as well as a collision damage waiver. See our Rates page for an explanation of limits and costs.